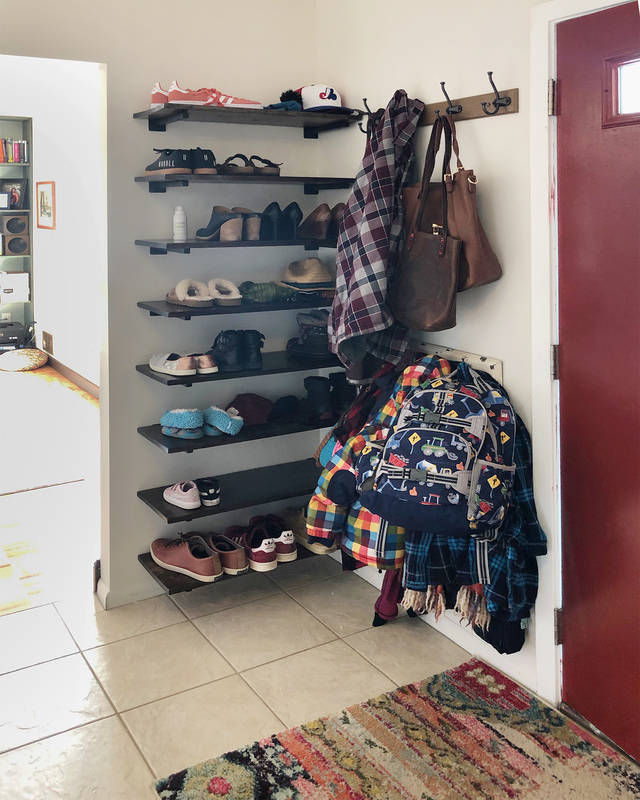 DIY Entryway Shoe Shelf - Brick & Banister Real Estate Co. This quick little project has been a long time in the works. 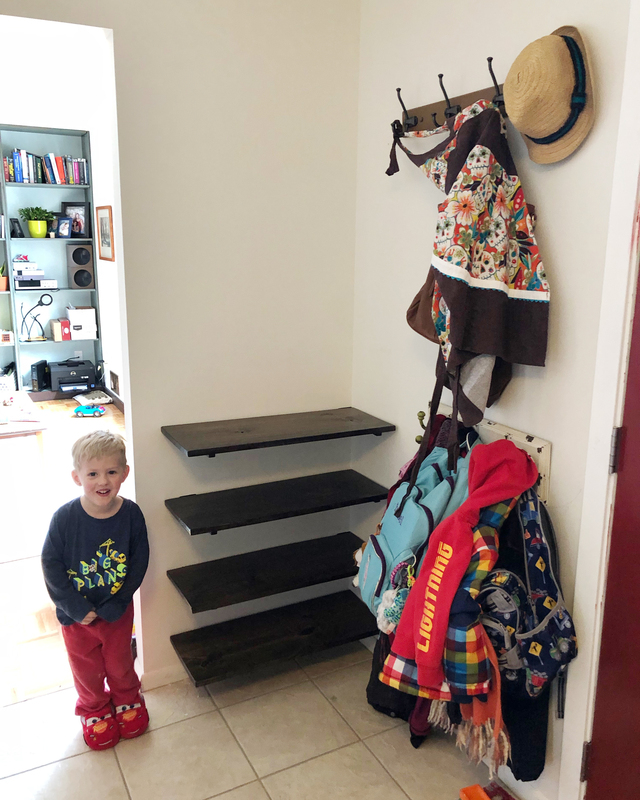 If you’ve got kiddos, you know that shoes and coats and hats and mittens and backpacks and all kinds of outside junk pile up pretty quickly. 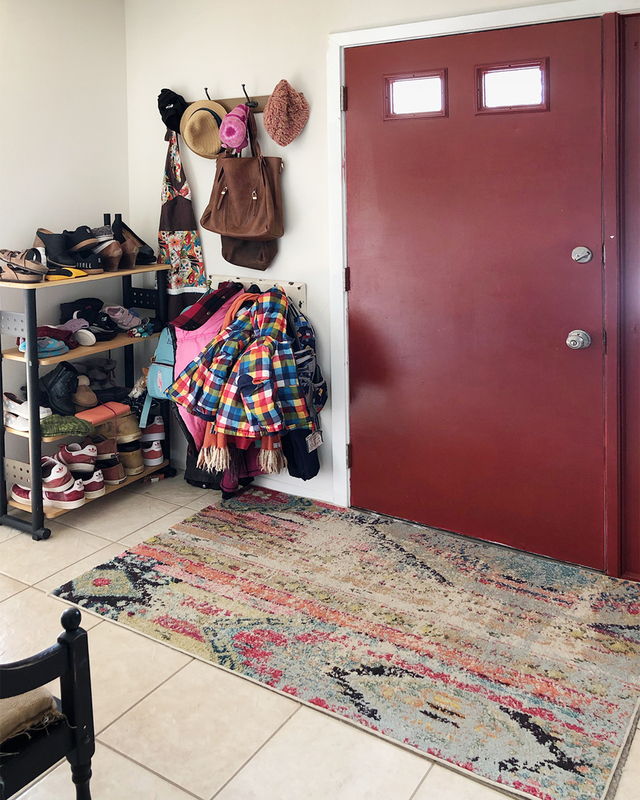 In new construction, we have been seeing the trend of larger mudrooms with ample closet space and cute little lockers with cubbies for storage. These setups are SUPER functional and I would kill for one. At the current moment however, I live in a 1979 house that in fact has ZERO closets on the entire main level. I believe originally there was a closet in the entry way and the previous owners removed it. I’m glad they did, because we have a very large entryway because of it, but we still have the problem of what to do with the shoes. 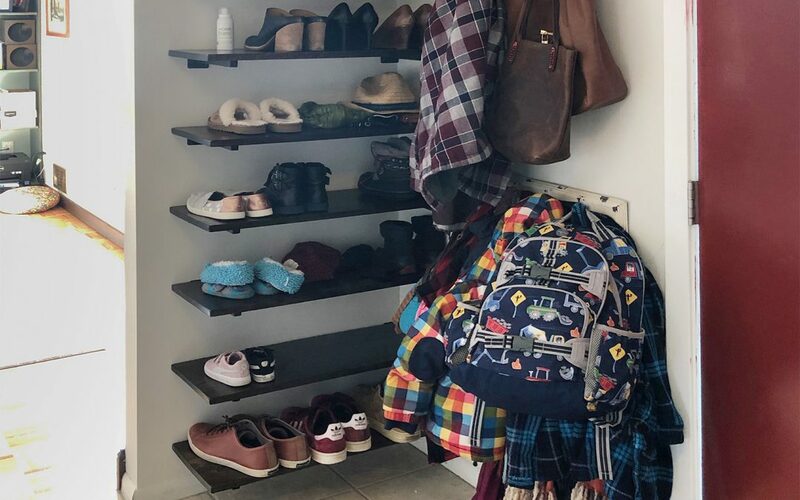 For the past several years, we have been using an old bookshelf to store the shoes, and we originally had a freestanding coat rack. Last year we put some hooks on the wall and that has helped a ton, but the bookshelf was never meant to be a permanent solution. As much as I’d love to build a little corner bench with cubbies, that would force me to make a decision on this tile floor, which I would LOVE to replace, but with everything else going on, it isn’t really in the cards for us at the moment. So, I decided that several open shelves would be the ticket. I wanted something that we (Roomba) could easily vacuum under, and that provided enough space for everyone’s stuff, ideally two shelves per person. Based on the size of the bookshelf, I decided that a 1”x12” board would be fine for size and decided on 8 shelves. I also decided that they didn’t need to be spaced much more than 8” apart to be able to fit our taller winter boots on the shelves. 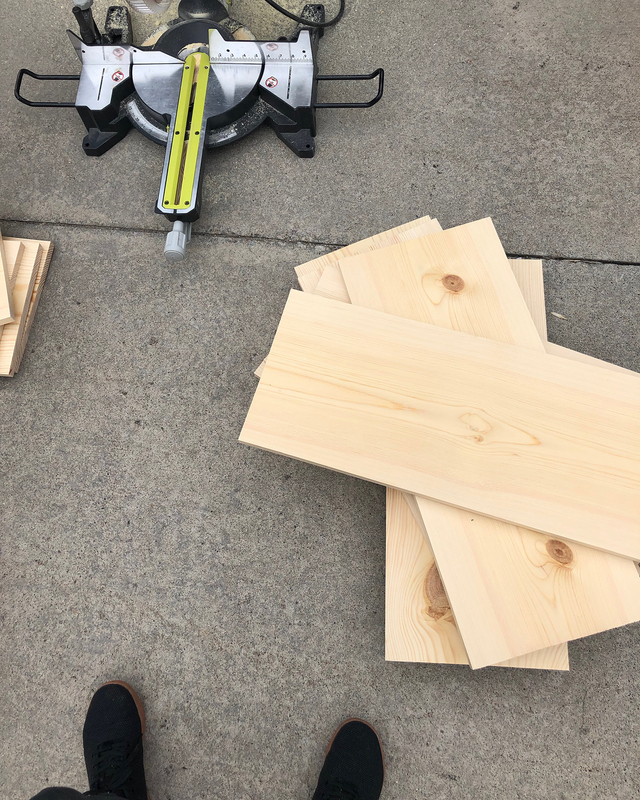 I did some math to figure out how many feet of 1”x12” I would need and headed to Home Depot to get some supplies. I also ordered these open shelf brackets on Amazon for mounting them. Since a 1”x12” is actually closer to 1”x11” I got the 10” brackets so they wouldn’t stick out past the boards. 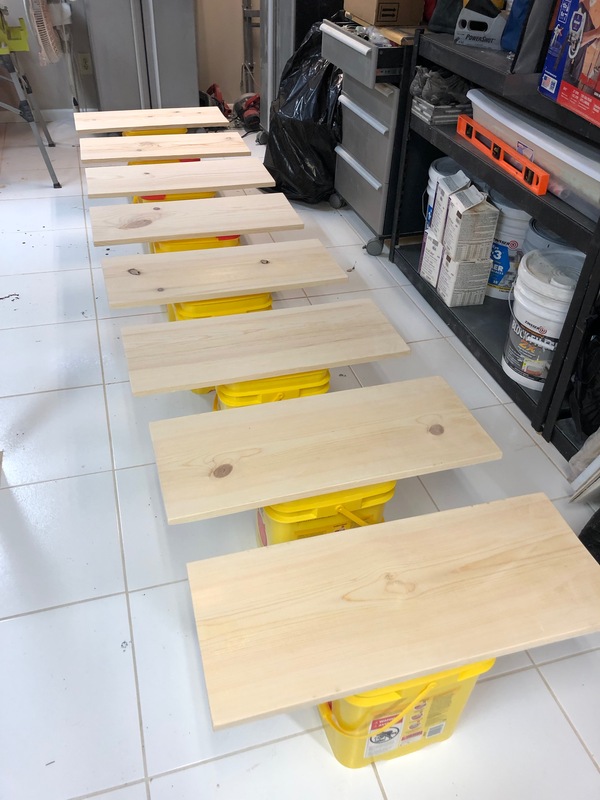 Of course I messed up my math here and ordered only 4 brackets (thinking 4x2=8 and I have 8 shelves, but of course 8 shelves need 16 brackets so I ended up having to wait a few days to install all of them=)). 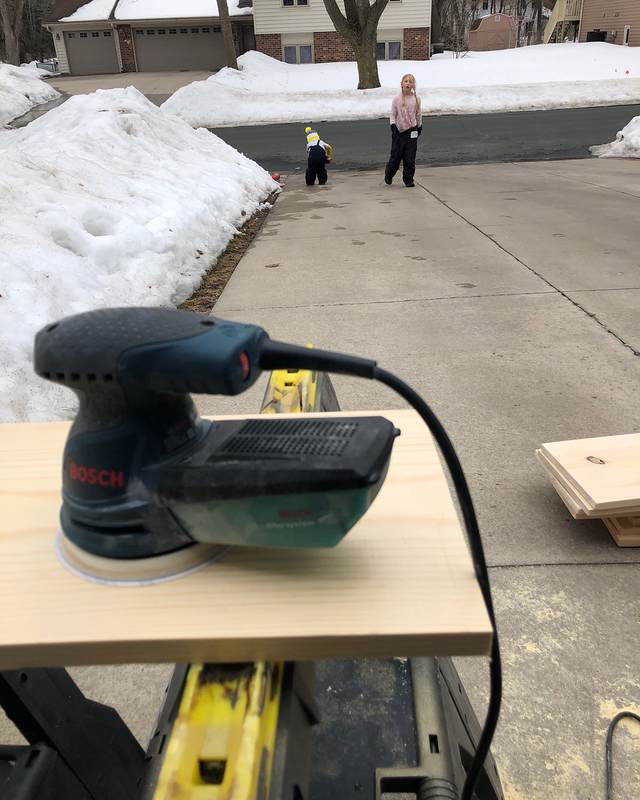 After school, while the kids were playing in the melting snow, I chopped the boards down to size. 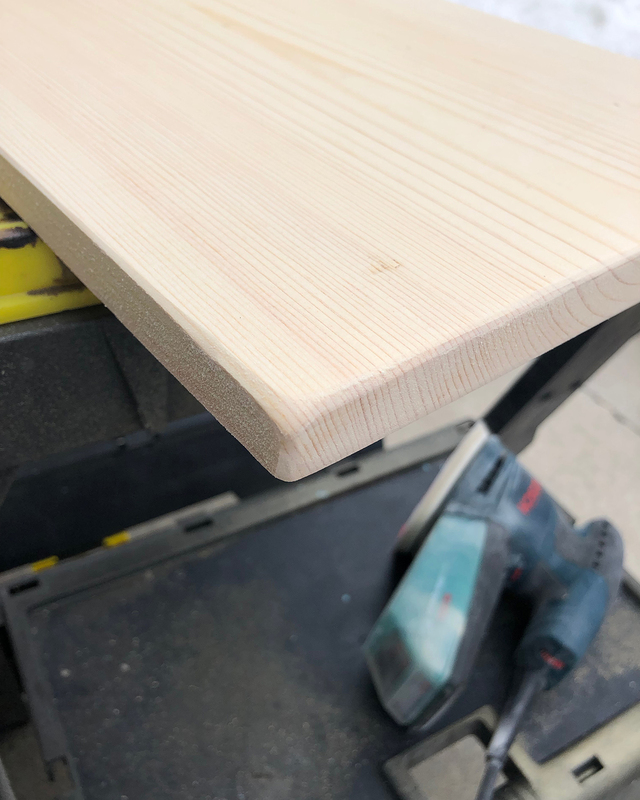 Then, I gave them each a quick sanding with 220 grit so they are pretty smooth, and rounded out the corners by running the sander along each edge and corner. I brought them inside to finish up. We needed some contrast in our entryway and we have almost no wood in our house (I’ve been systematically adding wood back in, see our Hickory Hardwood and Parquet in a Day posts), so I knew I wanted to go darker. Jacobean is one of my favorite rich warm browns so I gave each board a very light coat with the stain. 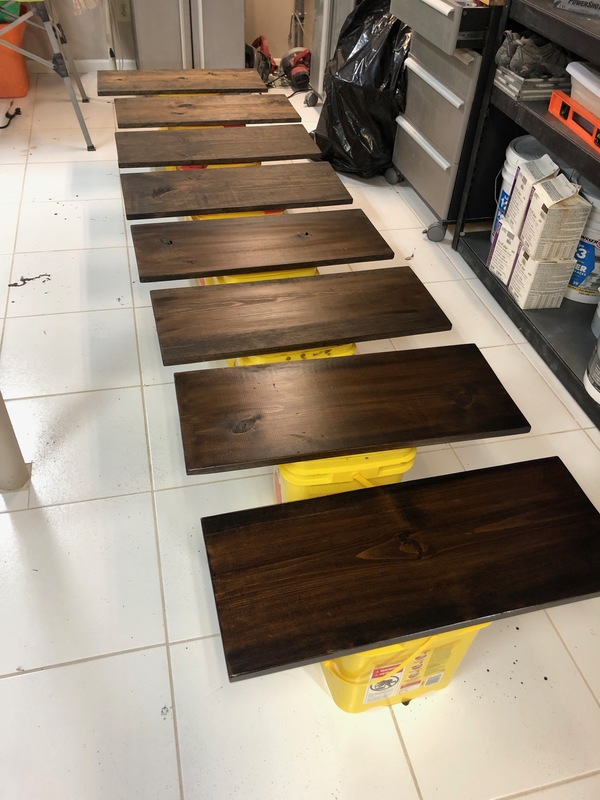 There are a lot of different views on how to apply stain, and I’ve tried a lot of them, but my usual fave method is to brush it on, then give it a minute to soak in, then wipe off the excess with a cloth. The stain looks really dark when you first put it on, but as it soaks into the wood, it lightens up a bit and evens out. After about 24 hrs, it is ready for polyurethane. I frequently use colorful polyurethane over stained wood because it gives it a really rich and deep color. 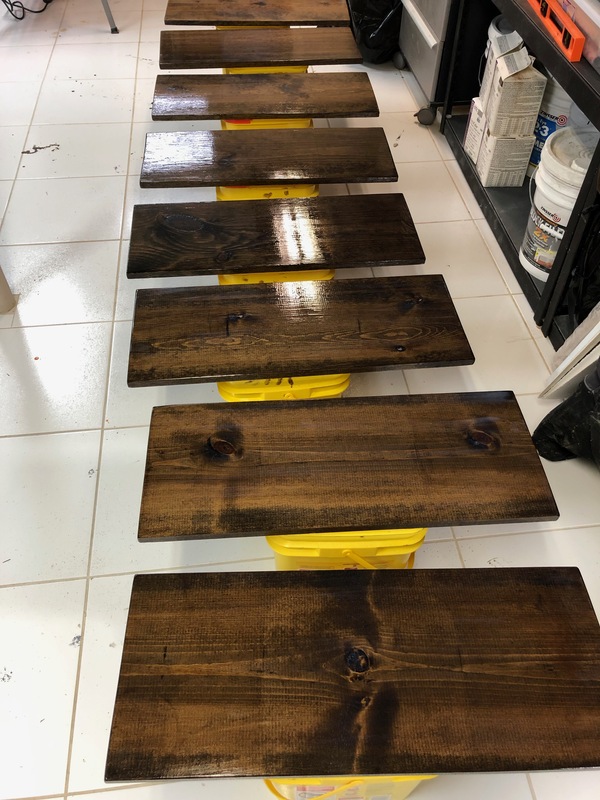 In this case, I used golden pecan in the Varathane water-based stain + poly in one. This stuff dries really quickly and isn’t stinky. You can recoat after 30 minutes so it’s pretty quick to get two coats on in not that much time. It has a really nice satin finish too. Once it dried, we were ready for install. 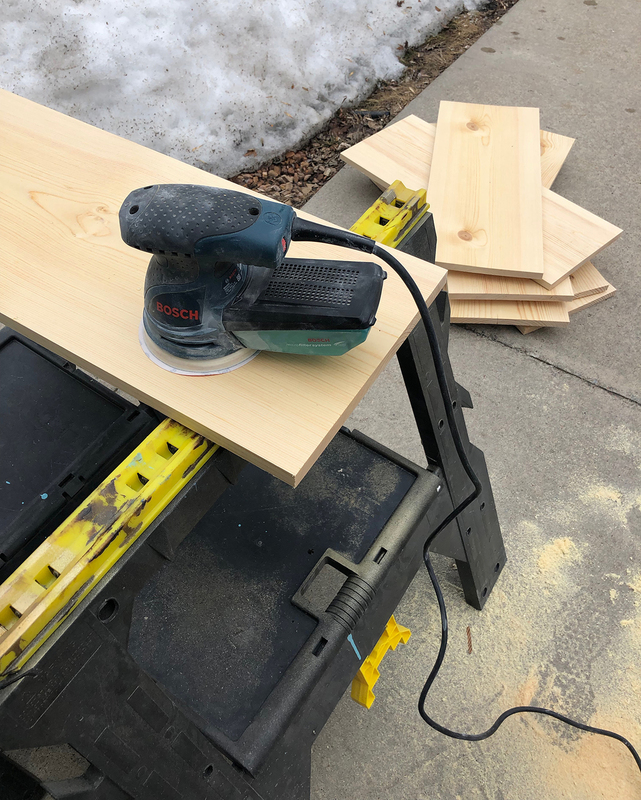 Using a stud finder, we attached the brackets to the studs with screws and spaced them about 8” apart vertically. The boards attached to the brackets with screws as well so they aren’t just set on top. Henry was a pretty excited helper. And that’s about it! My husband even complimented me that this was a great idea and well executed on my part. This might sound like a normal thing, but in our case, he usually thinks my ideas are just making work for the sake of making work. This whole project was about 4 hours total of work and cost less than $100. We can’t wait until we can put all the winter gear away and have even more space for the summer, but this has definitely solved our storage problem for the moment.